Collection station availableType: Notebook/LaptopBrand: FujitsuProcessor: Intel Core i3 1st Gen.
Fujitsu LIfebook u772 Ultrabook 14" Screen, 120GB SSD 32GB SSD HD, Core i5 1.8/2.8GHz, 4GB, Windows 10 Pro, 2 month Warranty! Make / Model Fujitsu Lifebook U772. Designed to provide power with portability and battery life. Brand: FujitsuProcessor: Intel Core i5 6th Gen.
Fujitsu's E734 represents an overall good compromise of portability, endurance, and computing power. The integrated LTE modem supplies Internet access remote from Wi-Fi. Read in our report whether the Lifebook is compelling in its whole. 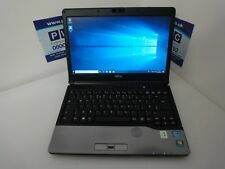 Ending 2 May at 11:24PM BST6d 12hCollection station availableType: Notebook/LaptopBrand: FujitsuProcessor: Intel Core i5 4th Gen.
Cheap Windows 10 laptop - Fujitsu Lifebook S762 laptop in excellent condition. None (fresh Windows installed). Good condition as seen in pictures, Marks on the lid as expected from an ex-corporate laptop. Collection station availableType: Notebook/LaptopBrand: FujitsuProcessor: Intel Core i5 3rd Gen. Processor: Intel Core i5 6th Gen.
Fujitsu LIFEBOOK E556 Black Notebook 39.6 cm (15.6"). 256 GB SSD Hard Drive. Windows 10 Pro. 15.6" - 1366 x 768 Screen. Fujitsu Lifebook U772 Slim and light weight laptop in good condition. 240GB SSD Plus 32GB SSD Cache drive. Hard Drive. Optical Drive. Built in 1000 Gigabit Mini Network Port (requires an adapter not supplied), Built-in Wireless. Model- Lifebook A556. Hard drive- 500GB HDD. Ram- 4GB DDR4. Repairable & Defective. Change of mind. Fujitsu LifeBook A512. Hard Drive : 320GB SATA. Various : Webcam, HDMI, SD Card Reader. AC Adapter : Included. Battery : Minimum 3 hours standby. Type: Notebook/LaptopBrand: FujitsuProcessor: Intel Core i3 3rd Gen.
Fujitsu Stylistic Q702 Tablet with Docking station. Dock has built in extra battery for extended use as well as few more ports. Missing Stylus pen but you can use the touch screen. 256GB SSD (solid State drive). Fujitsu P702 Laptop Summary. PICTURES ARE VIEWS OF THE ACTUAL FUJITSU P702 LAPTOP THAT IS FOR SALE. Fujitsu Lifebook P702. WIFI, E-NET, Bluetooth & 3G. Fujitsu FPCBP282 11.1v @ 63Wh. SOUND AND NETWORK. Fujitsu Lifebook S762 Laptop. 4GB ddr3 Ram. All photographs are of the actual laptop. The laptop has been cleaned externally and is ready to use straight away! The specification of the laptop is listed below. Type: Notebook/LaptopBrand: FujitsuProcessor: Intel Core i7 3rd Gen.
Fujitsu UH572 intel Core i5-3337U @1.80GHz,4GB RAM, 500GB,Charger included.. Used and in good working order with fresh Windows 10 pro installed on it. Some marks and scratches on it,few small dents. PLEASE CHECK ALL THE UPLOADED PHOTOS FOR THE CONDITION AND MORE DETAILS Dispatched with eBay delivery – Shutl 2 day. Fujitsu Stylistic Q702 Tablet with Docking station with touch screen. 256GB SSD (solid State drive). None (fresh Windows installed). Good condition as seen in pictures, few minor marks on the lid and screen as expected from an ex-corporate laptop. Fujitsu Lifebook T4410 Duo Core 2.53Ghz 4GB Ram 80GB HDD Win 7 Pro Webcam Good Battery. Fujitsu Lifebook A555 15.6" Laptop. i3-5005U 2GHz. Windows 10. Fully tested and working. Windows 10 Professional installed and ready to use. In good condition with minimal wear to casing from use. Your right to cancel. Ending Sunday at 6:03PM BST2d 7hType: Notebook/LaptopBrand: FujitsuProcessor: Intel Core i3 5th Gen.
WHAT'S INCLUDED: - Laptop ONLY. SHELF CODE: M12-2 2GSJ. WHAT'SNOT INCLUDED: - Power adapter / Other accessories / Cables / Software / Drivers etc. TESTING: - The unit Powers up to BIOS fine with no errors or passwords. TESTING: - Unit has a unknown BIOS password. WHAT'S INCLUDED: - Laptop ONLY. SPECIFICATION: - See title/images for specification. OS is not installed. - Battery, Optical drives, USB Ports if included etc aren't tested. OVERVIEW Fujitsu LIFEBOOK P727. Series Lifebook P727. Storage: 128 GB SSD. Faulty products - Manufacturer & SaveOnTech 12 Month Warranty. For example, Earphones, VGA Cable, User Manual. At Least 12 Months Warranty. Brand: FujitsuProcessor: Intel Core i5 4th Gen.
Model- Lifebook A555. Hard Drive- 500GB HDD. Ram- 4GB DDR3. Repairable & Defective. Change of mind. Fujitsu LifeBook U904. Hard Drive : 128GB SSD. Various : Webcam, HDMI, SD Card Reader. CD Drive : None. AC Adapter : Included. Battery : Minimum 1 hour standby. Collection station availableType: Notebook/LaptopBrand: FujitsuProcessor: Intel Core i5 4th Gen.
Fujitsu Lifebook Laptop E744 i3-4000M 2.40GHZ 8Gb Ram, 500GB HDD Windows 7 installed bit comes with win 8 installation CD. Condition is Seller refurbished. Few scratches to front cover but overall in good condition. Port replicator. Fujitsu Lifebook E752, Core i5-3320M, 8GB RAM, 500GB hard drive. Both the built-in and external displays are in great condition without any marks or scratches. I used the notebook with an external keyboard and mouse so the built-in keyboard is in very good condition too. Type: Notebook/LaptopBrand: FujitsuProcessor: Intel Core i5 3rd Gen.
D – Heavily marked (Gouge or deep scratch). Problems canalways be resolved if the opportunity is given. What you see in the photo is what you will receive no more no less. Fujitsu Lifebook A series AH530. Interl Core i3 m370 @2.40ghz. DISC DRIVE. 1x SD card. Fujitsu Lifebook U772 Ultrabook. Core i5 1.8GHz 3427U CPU. Super slim design. Has a WWAN slot for a simcard for internet on the move. 2 USB Ports. Type: Notebook/LaptopBrand: FujitsuProcessor: Intel Core i5 6th Gen.
FUJITSU LIFEBOOK S762. 160GB HARD DISK. i3 2328M 2.2GHz CPU. UK SPEC KEYBOARD. NOTE THERE IS NO OPTICAL DRIVE FITTED (HAS BLANKING COVER). Fujitsu Siemens laptop AMILO Pro V 2055 LAPTOP WIN7 *QUICK SALE. Fujitsu Lifebook E744. Fujitsu Lifebook E744. 500GB Solid State Hybrid Drive. 500GB Solid State Drive- 465GB Usable. Hard Drive. All updates, both Windows and Lenovo, have been done. Just switch on and you are ready to go. BASIC SPECIFICATION ON THIS UNIT BEFORE UPGRADES: WINDOWS10 PRO. 120-180gb SSD. 4GB FAST RAM. 500-640gb HDD replace 120gb SSD FREE. is always convenient. Integrated WLAN, Bluetooth®, keyboard with number pad, switchable webcam. 4GB DDR3 Ram. Hortonwood 2, Unit 3. Cherwell Enterprise Park. XPO IT Services Ltd. Unwanted Goods Get In Touch. Anywhere outside such as: Highlands, Ireland, Offshore or International countries will need to be quoted. Brand: FujitsuProcessor: Intel Core i3 3rd Gen.
Has expansion for cd drive.2 USB.Wireless and Ethernet.SD Card slot (2GB micro SD card and adapter included).And other various slots (google for more info)Windows XP Pro.Can run Linux or Windows 7 as well if your computer savvy (I have run both).Universal ac adapter.Zip up soft case. Fujitsu Lifebook AH512 15.6” Laptop Pentium 4GB 500GB Windows 10. Integrated WLAN and Bluetooth provide you with great connectivity and the spill-resistant keyboard with number pad provides extra reliability and usability. Unit is running windows 10 And is working well i3 2.2ghz cpu 4gb ram and 160gb hard disk (no optical has blanking plate fitted). 4GB Ram (On Board). Fujitsu LifeBook S710. Hard Drive : 160GB SATA. CD Drive : DVD /-RW. AC Adapter : Included. Battery : Minimum 4 hours standby. Collection station availableType: Notebook/LaptopBrand: FujitsuProcessor: Intel Core i5 1st Gen.
Fujitsu Lifebook AH530. - 500GB HDD. - Pendium Dual Core. BullGuard Internet Security 1 Year Protection up to 3 Devices. BullGuard Internet Security. 3 Device Protections. 500GB Hard Disk Drive. TROB: 4057185836692 REF-GR-A FUJITSU BUNDLE. Cloud-integrated Backup allows backup and encryption of files to Dropbox, Google Drive and One Drive. Fujitsu Lifebook U772. Fujitsu Lifebook U772 Laptop as described and photographed above. 4GB Ram for speedy multi tasking. HDMI to attach to a flat screen TV/ monitor. 14.1" Screen (1366 x 768). The warranty covers the hardware only, we do not warrant software or batteries.